Today, I am thrilled to suggest a healthy recipe to bake. These banana cookies are a perfect treat for a cold winter day - or any day! My Saturday suggestion this week probably seems like a bit of a "no-brainer." Most parents already understand the importance - and the joy - of spending time with their kids. I have been lucky enough to do a little of that with both of mine lately, so I've been thinking a lot about this topic. We had some quality family time when we met up with my daughter in Arizona for Thanksgiving. Parenting kids is a bit of an endurance test. Protect Your Heart -- Please Read This Before You Shovel Snow! Anyone with heart disease knows that there are things they should do to protect their heart ... but they may not realize the dangers associated with shoveling snow. Even people who believe their hearts to be healthy should know that there can be significant risks involved with shoveling snow. I've written about how heart attacks can be precipitated by snow shoveling on this blog before - but I'm doing so yet again today, as I don't believe the dangers associated with snow shoveling can be overemphasized. Temperatures in Montana this week have risen above freezing for the first time in a while. To avoid having icy walkways and driveways when the slush freezes after the sun goes down, many people here have been out shoveling. In parts of the United States, a big snowstorm is forecast for later in the week. This seems a good time to issue yet another warning. My previously published article Snowmageddon Storm Warning: Protect your Heart was written from the passionate viewpoint of my first-hand experience with patients who had suffered heart attacks after shoveling snow. During numerous years of working as a cardiac care nurse in both Pennsylvania and Ohio, (where snow is usually wet and very heavy when it falls) I saw far too many patients admitted to the hospital with chest pain after shoveling snow. Many people do not understand the deadly combination of exertion (often unaccustomed) and blood vessel constriction (a result of cold temperatures) that can occur when shoveling snow. Add in other risk factors, such as being a smoker or the stress of adding the task of shoveling to an already busy schedule; it all could add up to a heart attack just waiting to happen. Unfortunately, even if warning signs occur, people may not recognize the symptoms of a heart attack or just ignore them because they are focused on completing the task. So, today I implore you to read (or reread) my article and share this information with people you care about. If it is not snowy where you live right now, I hope you store this information away for when and if you ever need it or have an occasion to pass it on. Even if you are young with no known cardiac history, take note of the tips offered for how to shovel snow more safely and familiarize yourself with the symptoms of a heart attack. If someone you know is elderly or has a cardiac history, please encourage them to find someone healthy and strong to shovel for them. To read the article I have mentioned here, either search: "Snowmaggedon Storm Warning: Protect Your Heart!" or just click here. What are your thoughts on shoveling snow? Do you live in a place where it snows? Saturday Suggestion: "The Boys in the Boat" is a great read. Update (1/18/16). In an attempt to format this post a little differently and improve the way that it is loading on this blog, I am adding one more photo. This photo (taken in 2010) has nothing to do with the following book review, but it is of "a boy (my son) ... in a boat!" I recently picked up a copy of The Boys in the Boat by Daniel James Brown, and I could hardly put it down until I read it all. I have been blogging and writing less than usual in recent weeks, but I have been reading more. I have always been an avid reader and love to lose myself in a fiction book. Unfortunately, other obligations can easily become neglected when my mind is held captive between the pages of a good book. In order to be a productive writer, for a while I was neglecting reading. As I establish a new blogging routine, I am hopeful I can find a good balance between writing and reading and everything else! Before reading Daniel James Brown's book I had very little interest in or curiosity about rowing. I had never even heard about the dramatic quest for an Olympic gold medal in 1936 by the University of Washinton's 8-man crew team. My attention was riveted, however, from the very first page. Brown draws the reader in quickly and completely, with his beautifully written prose and ability to make characters come alive on the page. This is a book about rowing - and so much more. I learned some interesting historical and geographical facts of which I was previously unaware, gained new insight into human character, and most of all gained a better understanding of the elusive element that takes a team (of any kind) from good to great. Brown explains that the near-magical quality of "the Boat" is not the vessel itself, or the expertise of a single person, or even the contributions of each team member, but something else; something made up of everything that they each contribute. Recently touring a college in the Pacific Northwest with my son, our campus tour leader was a member of the school's crew team. I wanted to ask her if she had read Brown's book, but I refrained as that question somehow seemed redundant. I had already seen the book for sale on a table of "staff pick's in the University bookstore, and I assume that by now it is mandatory reading assigned by every crew coach across the nation. This book has something for everyone. It reads like a novel; filled with adventure, competition, and even a little romance while being both informative and inspirational. I'm very glad I took the time to read it. As I looked at this display, I thought about the amount of trust and teamwork it would take to build and row a boat like this! Have you read The Boys in the Boat yet? It's Time To Step Back, Regroup, Plan and Prepare! When I began this blog, I was posting six-days-a-week. After about a year I decreased my publishing to a Tues.- Wed.- Fri.- Sat. schedule. I was faithful to this commitment until the past month or so. If you subscribe to my daily emails or you've stopped by this blog since last Friday, I am sorry that you found nothing new. Despite good intentions, I've had nothing prepared to post. I used to have a really good blogging routine - - and then it broke. 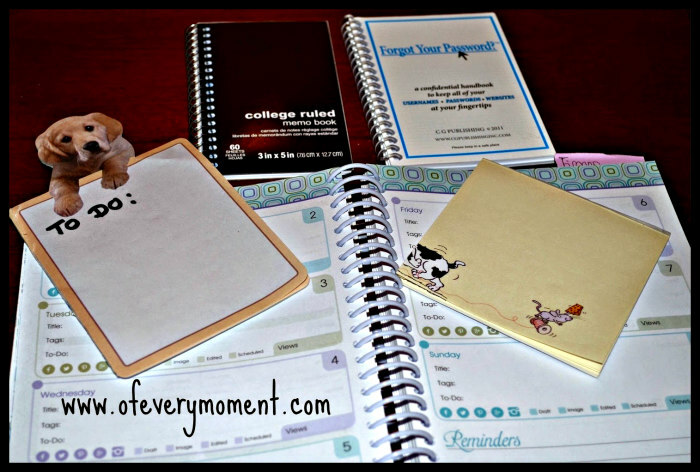 I previously published this picture to show some of the tools I use to stay organized. They haven't been used enough for a while! Several months ago, my husband and I began working-out together before he goes to work, so I've been getting up an hour earlier than usual. My creativity has always been best late at night, and that's when most of the contents of this website has been written. While I understand the benefits of daily exercise and I love the extra hour with my spouse, I lost the rhythm of my routine when my sleeping patterns changed. An earlier bedtime became imperative. For a while, I was still able to keep up with my blogging tasks, but I was no longer following the schedule that had become a habit. The demands of the recent holiday season and a desire for more family time limited both my writing and my time spent on social media in December. Everything sort of fell apart. Blogging requires a lot of self-discipline and it is easy to be tempted to let tasks slip. Before I knew it, I had used up my reserve of pre-written posts, and this week I found myself with nothing prepared, no plan in place ... and the worse case of writer's block that I have ever experienced. I've learned that I need to implement a new blogging system.The importance of preplanning and a good working routine should not be underestimated. In fact, I've been thinking a lot lately about the role that routines play in our daily lives, and I may even write about this in a future post. Sometimes the best way to make the most of a moment is to step back, regroup, plan, and prepare. The frequency of my blog posts may decrease a bit as I do so, but it will hopefully be worth it in the end. Does switching to a different sleep schedule interfere with your routines? I have always enjoyed new recipes; I love to cook and I especially love to bake. Like many people, however, after enjoying the delicious temptations throughout the holiday season I have been trying to return to better eating habits this month. After Christmas, I put myself on a bit of a baking ban. This was a measure needed to reset my sweet tooth and resume eating a healthier diet. To my delight, however, this weekend presented an opportunity to to try a banana bread recipe I have had my eye on for a while. Yesterday afternoon I realized I needed a hostess gift for some friends. Some really ripe bananas were sitting on my counter and the temptation was just too strong. In a flash, I had the ingredients for my new banana bread recipe lined up on the counter. You are probably familiar with the idiom, "What goes around, comes around." According to the definition offered in The Free Dictionary by Farlex, this means "The results of things that one has done will someday have an effect on the person who started the events." I have found this to be true in my own life. Just as I started high school, my family moved to Mallorca, Spain. For four years I attended the American School of Mallorca and I lived at home, but a high percentage of the students were boarders. Many of my friends lived in the rooms in this building at the American School of Mallorca. Saturday Suggestion: Perfection Promotes Procrastination. Today's Saturday Suggestion is to strive for good enough, as I believe it is a desire for perfection that leads to procrastination. This poster hangs in my laundry room where I see it daily, and this advice given by Thomas Jefferson is still very applicable today. His first rule cautions us to avoid procrastination. When stepping into a new year, 365 days stretch out before us with endless possibilities of what we might accomplish. Yesterday I commented that "like footsteps in the freshly fallen snow, it is fun to make the first strides in a new year." Here in Montana, the first day of 2016 is crisp, clear, and cold. Brilliant sunshine is reflecting off of sparkling snow, and temperatures are hovering around 5 degrees Fahrenheit. A truly beautiful day. Here's to all of us making great strides in 2016: as individuals, collectively as humanity, and in our efforts to be kind to each other and protect this beautiful planet on which we live.